Polar bears in the Arctic National Wildlife Refuge. In an internal memo circulated within the Interior Department earlier this year, government scientists issued a stark warning: The Trump administration’s plans to allow oil exploration in Alaska’s Arctic National Wildlife Refuge could further jeopardize the region’s already fragile polar bear population. The document, authored in September by the head of the state’s US Fish and Wildlife Service office, noted that the threat posed to the bears could make it legally challenging for the agency to authorize a series of seismic surveys of the area’s petroleum reserves—even if steps were taken to mitigate the project’s environmental impact. The memo, obtained by Mother Jones from a source outside of the Alaska office, describes its finding as a “preliminary analysis” based on “information currently available to us.” That analysis contrasts sharply with the administration’s public rhetoric suggesting that the project would be harmless and should therefore be quickly approved. Government scientists from the US Fish and Wildlife Service warned the Interior Department that it would be nearly impossible to carry out oil exploration in Alaska’s Arctic National Wildlife Refuge without further jeopardizing the region’s fragile polar bear population. Based on initial information, the memo estimated seismic surveys, used to detect petroleum reserves, could result in death or injury to 15 polar bears — enough to threaten the survival of the region’s polar bears. The Trump administration and the Bureau of Land Management have continued to downplay the impact that seismic surveys could have on the refuge despite warnings of serious environmental and legal obstacles. The surveys are expected to begin in early 2019, and must be carried out during the winter months — the same season when bear cubs are born and are most vulnerable. Despite the Fish and Wildlife Service document warning of serious environmental and legal obstacles to the project, the administration has continued to downplay the impact that seismic surveys could have on the refuge. FWS would not comment on the memo but said that the application submitted by SAExploration—the company seeking to undertake the surveys—has since been revised and that the agency now intends to issue the necessary permits. “Over the last several months the application has changed, and as a result, our analyses and findings have changed,” said FWS Alaska regional director Greg Siekaniec—the official who authored the original FWS memo—in an email. Siekaniec did not offer details on how the application had been modified to reduce the threat to polar bears but said that information would be made available when the proposed authorization is published. SAExploration did not respond to calls or emails to its Houston and Anchorage offices. In late July, the Bureau of Land Management announced that seismic surveys would likely have little or no impact on the region’s environment and sensitive species, including the Southern Beaufort Sea’s polar bear population, which has declined rapidly in recent years due largely to climate change. A BLM spokesperson told Alaska Public Media that because “there would be insignificant impact,” the Interior Department intended to forego a time-consuming environmental impact statement and instead issue a less rigorous and much shorter analysis known as an environmental assessment. But then the FWS—which, like the BLM, is part of the Interior Department—began sounding alarms. On September 6, Siekaniec sent his four-page memo stating that, according to the agency’s preliminary analysis, it would be virtually impossible to carry out the surveys without further jeopardizing the polar bear population. That conclusion presented a major legal problem for the administration. Under the Marine Mammal Protection Act, the FWS can authorize what’s known as the “incidental taking” of polar bears—which includes activities likely to result in injury or death to the animals—only if doing so will have “no more than a negligible impact” on the species. If the bureau cannot make such a determination, the incidental take permit must be denied. 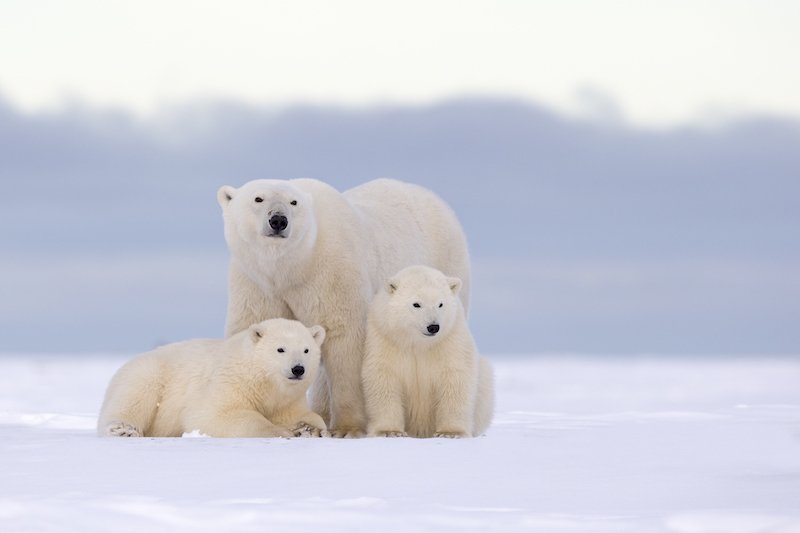 The refuge’s coastal plain provides critical habitat for mother polar bears during the winter months when they come on shore to den and give birth. Bear cubs are especially sensitive during their first few months of life and any disruption to their growth and development can be life-threatening. The denning period also happens to overlap with the only window during which seismic surveys can be carried out, since the ground must be frozen solid in order to allow for the passage of heavy vehicles and machinery. Even using the latest infrared technology, the FWS memo predicted that only about half of the bear dens would be detected during flyovers. That would leave approximately 8 to 10 dens that would be susceptible to disturbances from vehicle traffic, human activity, and seismic work. The threat is compounded by global warming. As sea ice loss has accelerated, more and more bears are coming inland, creating additional pressure on the population. Steve Amstrup, a former US Geological Survey researcher and chief scientist at Polar Bears International, said the Interior Department hasn’t fully considered the challenges facing the Southern Beaufort Sea population. “If we don’t stop the decline of sea ice, polar bears are going to disappear,” he said. The memo considered mitigation measures—such as more frequent aerial passes to search for dens and spatial or temporal restrictions on seismic activities—but concluded that these were unlikely to be sufficient. The memo also appears to undermine the BLM’s assertion that an environmental assessment can be published with a draft finding of no significant impact—known by the acronym “fonsi”—and still pass legal muster. Under the National Environmental Policy Act, if such a finding cannot be made, then a more detailed environmental impact statement must be completed before the seismic surveys can begin. “Assuming FWS has relayed this information to BLM, it’s hard to figure out how they can issue a fonsi,” said one former FWS official who asked not to be identified. The Interior Department, which oversees both agencies, did not respond to detailed written questions for this story. Language included in the 2017 Republican tax bill that opened the refuge to oil and gas exploration designated the BLM as the lead agency on the project, even though the FWS manages the refuge. This has led to tensions between the two agencies and concerns that the BLM is cutting corners in order to expedite the surveys in advance of possible lease sales next summer. BLM employees have also raised concerns about the expedited environmental review process. The agency declined to provide additional details on the terms of the agreement and said it was awaiting more information from the company before finalizing the proposed permit. According to an Interior source who asked not to be identified, the BLM and the FWS have been discussing provisions that would, among other things, require SAE to reverse the direction of its work in order to complete its surveys of the densest denning areas before bear cubs emerge. But environmental advocates aren’t convinced that such mitigation measures will be adequate. And they’re prepared to file a lawsuit.